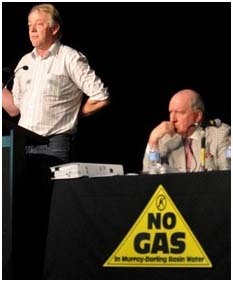 Key speakers included clinical psychologist, Dr Wayne Somerville, who warned of the psychological effects for rural communities under the threat of CSG expansion. Dr Pauline Roberts, health expert and until recently a resident of the Liverpool Plains, advocated activism as the only thing that will stop this madness. Drew Hutton of ‘Lock the Gate Alliance’, battling CSG in Queensland, warned that the Liverpool Plains in 2012/2013 could look similar to todays Chinchilla, with over 4,000 gas wells. “The Darling Downs will not only have 40,000 wells, but 20 to 30 coal mines too,” he said. The forum, organised by the Mullaley Gas Pipeline, SOS Liverpool Plains and the Caroona Coal Action Group, was attended by over 500 people. Rosemary Nankivell urged the forum “stay firm, stay focused – we will not put our precious water supplies at risk”.